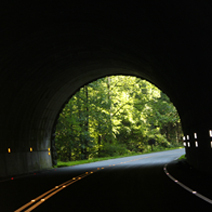 Tunnels add to the fun of driving on the Blue Ridge Parkway in North Carolina. Sports car owners drive from hundreds of miles away just to challenge the roads near the North Carolina-Tennessee state line. Mountains and clouds make a scenic backdrop as a car makes its way up a mountain along the Blue Ridge Parkway. The excitement of the twisty roads are an open invitation to those who own convertibles and sports cars. It was all about the roads. Miles and miles of heart-racing twists and turns. Sweeping curves along the scenic Blue Ridge Parkway. A winding two-lane blacktop that climbs over mountains and descends through lush forests. Those are the roads around the North Carolina-Tennessee state line. That’s what enticed a group of sports car enthusiasts to drive more than 900 miles one-way from Oklahoma City to Cherokee, N.C. The object of our desire was Deals Gap or Tail of the Dragon, an 11-mile stretch of road with 318 curves. That’s no typo. It’s considered America’s No. 1 road for motorcycles and sports cars, but plenty of other types of vehicles challenge the Dragon. Banked curves, a constant elevation and no intersecting roads or driveways add to the appeal and, for some, the need for speed. But know that the road is routinely patrolled by law enforcement. Driving the Dragon requires all eyes on the road and full concentration. This isn’t the place to sightsee. Save that for the nearby Blue Ridge Parkway or the Cherohala Skyway, a 45-mile drive that goes up and over the mountains in North Carolina and dips down through the Tennessee forest. While the roads and stunning scenery are enough for some, the area offers plenty more to see and do. We stayed in Cherokee, a town that’s steeped in American Indian history. Museum of the Cherokee Indian starts the history lesson at the beginning, some 13,000 years ago. With special effects and computer-generated imagery, it introduces visitors to the origins of Cherokee medicine, sacred festivals and the removal of the Eastern Band of Cherokees to Oklahoma Territory in a 2,200-mile trek along the Trail of Tears. The museum also includes exhibits and artifacts that showcase weapons, wardrobes, jewelry, carved masks, baskets, pottery, games, photos and manuscripts. Some spear points and axes on exhibit were used 10,000 years ago. Cherokee history also comes to life at the Oconaluftee Indian Village with re-enactments, demonstrations and dances. Don’t miss the council house, sweat lodge and ceremonial grounds. The village is open from May through October. An outdoor drama, “Unto These Hills,” tells the story of the Cherokees with live music, dances and authentic Cherokee regalia. The show unfolds in June, July and August. In the mood to shop? The Native American Craft Shop, the Great Smokies Fine Arts Gallery and the Qualla Arts & Crafts Mutual Inc. offer the artistry of dozens of Cherokee bead masters, basket weavers, potters, artists, stone carvers and wood carvers. Plenty of tourist-oriented stores line the two main streets, enticing shoppers with everything from T-shirts and souvenirs to fudge and moccasins. For those who prefer a different kind of action, there’s a Harrah’s Cherokee Casino & Hotel. Inside the hotel is Paula Deen’s Kitchen. The chicken pot pie is a sure bet, and it’s large enough to share. Cherokee is a good starting point for exploring nearby attractions such as the Blue Ridge Parkway, the Great Smoky Mountains National Park and Clingman’s Dome, a panoramic view from the top of the Smokies. The grand Biltmore House & Gardens in Asheville is about an hour east of Cherokee. Gatlinburg and Pigeon Forge, Tenn., are an hour away through the national park. Come fall, the foliage should be a colorful palette of reds, yellows and oranges that can be seen for miles. And don’t forget to take a turn on those roads.